Home Our Garage Door Services Garage Door Springs Should You Repair Garage Door Springs Yourself? If your garage door isn’t opening properly, and you’ve checked the transmitter batteries, there’s a chance you need replacement springs. If they need replacing, though you might come across DIY tutorials online, do you really want to face the risk of fixing the problem yourself? Not only will you need the correct tools for the job, but you will put your safety at risk doing so. Your springs pack incredible force, which could easily take a finger off without the proper training and experience. You could easily make the problem worse if you attempt to implement solutions yourself, so the best thing to do is call for professional help. Why are Extension Springs Dangerous? 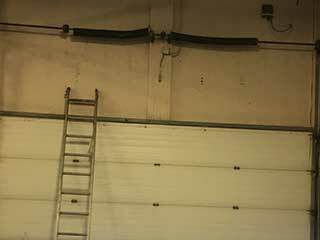 There are two types of springs involved in garage door operation: torsion and extension. They sit on top of the door frame and along the sides. They hold great amounts of tension, even when your garage door is closed. They stretch or extend when a door opens and closes, and if they need to be repaired, the safety cables must be detached. Disconnecting these cables is dangerous, because snapping springs can quickly turn into projectiles. If they hit you in the face, head, or anywhere on the body for that matter, it can be life threatening. You mustalso consider the weight of your door, because if that makes contact with any part of your body, you’ll dealing with a 400lb collision! Professionals have years of experience handling garage doors, safety cables, and springs. They can capitalize on this to meet your needs, having encountered every issue under the sun. Contractors may lubricate your springs or suggest removing parts when necessary. Leaving it in the hands of professionals offers peace of mind, but what you can do to help is regularly monitor the condition of your door. If you start hearing any squeaking sounds, or other irregular noises, you’ll get an sense that something isn’t quite right. This might indicate a problem with your springs, and having identified the issue, you can call an expert with confidence. Garage door springs aren’t to be played with, so make the right decision by utilizing expert help! If you have any further questions, please contact our team and we’ll get back to you as soon as possible.